It’s rare to see a side-by-side on a game shoot these days. They have fallen out of fashion and, although us shooters might like to think we are sticklers for tradition in our tweeds and brogues, many tastes in the shooting world are subject to trends. A case in point is the 16-bore. 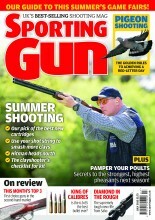 Once thought of as a calibre for ladies or young shots, it is enjoying a serious revival among many shooters. So, for this gun test I thought we would do something a little bit different: combine a review of a prestige side-by-side, the EJ Churchill Regal, in the new ‘flavour of the moment’ calibre,16-bore. First, let’s deal with 16-bore and why it has become so popular. Perhaps it’s best to look at why shooters moved away from this calibre in the first place. One reason might be an increasing fashion to shoot at extremely high pheasants. This resulted in weighty over-and-under shotguns being used in the field because they could handle heavy cartridge loads. Guns weighing up to 9lb with 32in barrels have become the norm on driven shoots, especially on high bird days in places like Devon. The weight of these guns absorbs the recoil of a heavy load cartridge. A light gun with such a load would kick like a mule. However, one thing is for sure and that’s the resurgence of interest in 16-bore – big time. You might argue that a 16-bore, which sits between 12-bore and 20-bore is a good compromise. It combines good handling but can handle heavier shot loads and arguably gives superior patterns. I hesitate to use the word ‘compromise’ because it has the negative connotation of ‘making do’ with something when you could argue that a 16-bore with a shotgun with a properly scaled action could offer the best of both worlds. Ballistic experts claim the 16-bore produces a perfect shot pattern. I haven’t the room to go into the physics of this here but suffice to say that the bore diameter and the size of shot produce a shot column of near perfect dimensions for good patterns. Seeing a side-by-side on a game shoot is now as rare as proverbial rocking-horse poo. Many of us have moved on to using over-and-unders for all our shooting needs, even game shooting, and side-by-sides have been left to languish in the cabinet. Recently, I have been forced to reappraise side-by-sides. Having tested several in the magazine gradually I came to enjoy the radically different shooting characteristics: the double triggers, straight grip and the relatively light weight compared to over-and-unders. All these features cast a spell on me and made me truly appreciate, not just the art of making a side-by-side in the true English tradition but the fine handling characteristics of such guns. This month I was introduced to another side-by-side beauty sporting the illustrious name E. J. Churchill. The Regal side-by-side in 16-bore (also available in 12-, 20- and 28-bores as well as .410) may be signed E. J. Churchill but is actually made by famous Spanish gunmakers AYA. If the gun was made in the UK by hand, it would cost 10 times as much. However, there is a slight discrepancy between the price of an E. J. Churchill Regal and the AYA No2 it is based on, the Regal being slightly more expensive. That’s because with the Regal the gun will be made to fit, with the chokes bored out to whatever specification you want (a multichoke version is available) and it also comes with an initialled leather case. All this justifies the slighter higher price of the E. J. Churchill gun. Matt Clark with Mark Adams (instructor) and the gun. 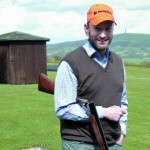 AYA has made its name making side-by-side game guns in the English sporting style and has earned a reputation in its own right having provided thousands of shooters with a good-quality gun at a competitive price. As such, the company is ideally suited to produce guns for a British company that has an illustrious past stretching back to 1891. The E. J. Churchill Regal comes in 28in or 30in barrels (tested), with 2¾in chambers and has a 15¼in straight-hand stock. As with the AYA No2 it has Holland-style lock work. The one I tested had full and full chokes but, as mentioned earlier, they can be bored out to whatever choke you want. There is even a multichoke version should you feel the need. A round body action, splinter fore-end and double trigger all scream classic English game gun. Picking it up, you feel how beautifully balanced the gun is with the balance just on the hinge pin. The Regal feels svelte, lithe and full of character. It makes over-and-unders feel large, cumbersome and ungainly. That said, many shooters like more substantial guns because they absorb recoil, slow the gun down making the shooter feel as if they have more control. Each to their own. Arguably smaller calibre guns are better with longer (30in) barrels because they increase control. The gun is relatively light at 6lb 14oz with the 30in barrels, which is the advantage of opting for the slightly smaller 16-bore version. This gun would be too special to use on a walked-up day but if you did, then it would be a delight to carry. Even on a peg it’s less fatiguing to have a lighter gun that can be swung with ease. Being tired means you miss shots because you become sloppy. As for the aesthetics, the sideplates were nicely detailed but not over profuse – classy. There is some engraving on the trigger guard and on the extended tang. The gun I tested was part of a pair but it was not numbered. This means the gun can be sold on its own or as a pair. It makes economic sense both for E. J. Churchill and the customer. All the screws were lined up, a sign of a quality gun, and the gun is signed E. J. Churchill on the bottom of the receiver. The barrels were nicely struck up and blacked with a concave rib finished with a brass bead at the muzzle. All very English. The woodwork was straight grained with the emphasis being on strength rather than beauty. That is my choice any day of the week. Barrels are chopper lump and are hinged on a removable cross pin, so the gun can be rejointed fairly easily should it become loose after years of service. Likewise the firing pins are also disc set for ease of replacement. The mechanics of the Regal are a relatively simple bar action side plate design with main ‘V’ springs, which are said by some to give a quicker lock time and more consistent trigger pressures than coil springs. You will find ‘V’ springs on most of the more expensive shotguns. The Regal may bear the name of a fine English gunmaker but it can be repaired at a fraction of the cost of a quality English gun. What’s more, AYA has a solid reputation for build quality, so the Regal is unlikely to let you down. It is the handling of the Regal that really puts it on a par with more expensive best English guns. It moved fluidly when tracking some crossing clays and the relatively light weight made it very pleasing to use. The scaled action really gives this gun superb balance and fantastic handling. Lighter guns tend to give more of a ‘kick’ because there is less heft to absorb the recoil, but the 16-bore felt comfortable in the shoulder and there were no nasty jolts. The fact that the stock was just over 15in and fitted me well contributed to the comfort. However, bear in mind that if you are shooting in the season you are likely to have lots of layers on, which would make the length of pull even longer. The slim neck and straight stock were also comfortable and allow easy access to both triggers. The trigger pulls had a pleasing weight to them and the auto safety had a beautifully engineered feel to it. The gun closed with a nice ‘thunk’ with no rattles or jingles and the gape was good, which makes for quick reloading when the action is thick and fast. One advantage of a side-by-side is that reloading tends to be easier because the breech opens further. The Southgate ejectors did a brilliant job of spitting spent cases yards behind me. It is hard to find fault with the E. J. Churchill Regal. Once I got used to the gun I shot well with it. The handling was superb and the build quality was top notch. Yes, it would be lovely to have a best English gun but it would cost 10 times as much and repair bills would be much more than any incurred by the Regal. As it is the Regal offers you the performance of a best English but without the hefty price tag. Detractors might say that the Regal is an AYA with an E. J. Churchill designation, which is true, but as The Bard would say, “a rose by any other name…” E. J. Churchill is not trying to pass off a No 2 as its own. It’s upfront about the Regal being a collaboration with AYA and has left the manufacturers markings on the receivers to prove this. The Regal only costs a bit more than a No 2 because it comes with a beautiful case and the gun is tailored to your specification at the famous E. J. Churchill gunroom. The Regal is a fine gun. It is worthy of consideration if you want something that performs well and looks as good as a London best gun, but for a more modest price. I can’t fault it and with the build quality, the Regal would last many, many years, so would prove a good investment. After all, where else can you get your hands on a piece of gunmaking folklore at a relatively affordable price?